Case of the Mondays Race Report. The Natural State. This weekends races took place in beautiful Bentonville, Rogers and Springdale Arkansas. All three races were Criteriums. By the way, the race report is not always about the races. Here are most of the actors in this weekends report. Sev, Jordan, Ian, Zach, Molly, Will, Bonnie, Jeremy, Jen, Chris and the race director. Friday: Sev, Ian and I left Kansas City Friday afternoon. So, this was a surprise road trip crew. Ian and I were set on driving down. The surprise was Sev. I had mentioned the race to her and to drive but didn’t think she was all that interested in going. So, this was our crew. Being on the road for 3 hours is just long enough to get to know someone and not long enough for them to drive you crazy, (I love my road crew). I have been on those 12 hour road trips and by the end of the trip, you have come to the end of your road. I named this road trip the gangster rap race weekend and proceeded to play Tupac as pulled into Cave Springs. 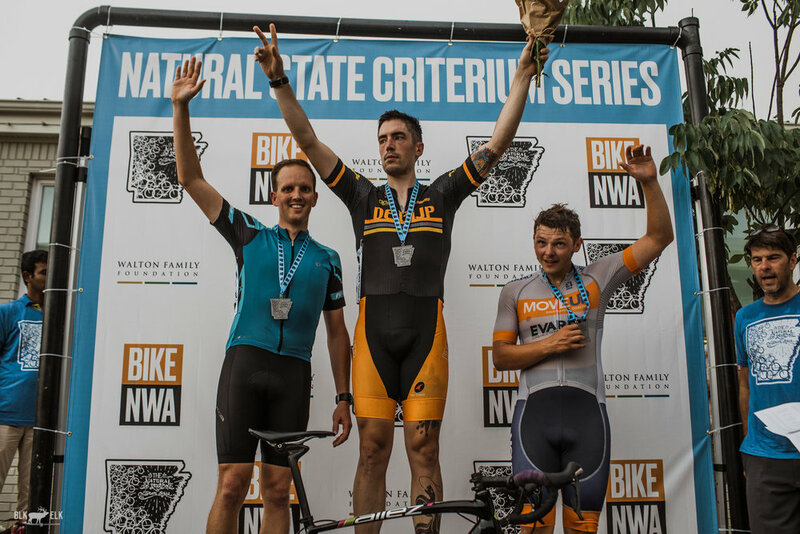 My reason for this was simple, it was the NWA (Northwest Arkansas) cycling community that was putting on the race. So, GRRW just made sense to me. After 3 hours of getting to know my fellow racers, we get to Cave Springs AR to our cottage in the woods (thank you Lisa and air bnb). It’s nice to have an entire house and not a hotel that you have cram into for an entire weekend. Enough about our accommodations, here is how the Friday night crit turned out. Well as you may or may not know, I race for the US Military endurance team but have created an alliance with a team called Move up. These guys are awesome and during this race we were hitting on all cylinders. Zach ended up with $100 prime with a little help from me pulling just before the prime was called. I am so proud of Zach and his effort. But Ian, this kid at 20 years old had some wisdom in this race. With about 2.5 laps to go I am sitting at about 4th wheel and waiting to drop the hammer. About that time Ian gets to my right outside wheel and when I looked back he looked loke he used a bit of energy to get himself into position. So, I give him a minute to breath and then I get out of saddle to start a push. Ian tells me “not yet” so I sit back in and wait for his command. This is important because he has a better view of what is going on and will know if a flyer is coming up the side. With about half a lap to go one of the racers gets out of saddle and that’s when I hear Ian say “now go go go”. So I took off and pulled through into the head wind and up hill section. I broke to my left to give Ian the sprinting room and he took off. Ian took 3rd place and I came in at 9th. Between the 3 of us we earned $280 for that race. Ian and Zach split there portion with me. They did not have to do that, I was happy to put in the work. not to mention that I am not a sprinter yet. I am more of the work horse. I am proud of those guys. At 28 and 20 years old they showed class. Sunday: Last day of the race weekend and it all started at 5am. After not getting enough sleep and burning out my legs, we all ended up not doing very well except for Sev, she was 9th and in the money once again. Ian ended up taking 12th and I was in the bottom half with Chris and Zach. Although it was fun, just not where we should have been. I did get to have some great conversations with Jeremy (Springfield, MO) and Chris (McPherson, KS). Actually, I asked Chris to come to AR to race. I was surprised he came down. Although, I think he is like me when it comes to traveling. Racing for me is not about winning. It is about having a great time and meeting new people. Don’t get me wrong, I most certainly like to win but it is not number one on the list. There are people that show up, either alone or with a team, they race and then they go home. Everyone has there own way and I can appreciate that. I am not wired that way. I like to show up early and maybe I get to put up barricades or the wheel pit tent. I get to know the race director (although I totally forgot his name). I figure that 99% of these folks are volunteers and many hands make light work. This is where I met Bonnie. Bonnie and I had an instant connection on Friday night when I asked about results and for some ice because one of the KC racers hurt his knee. We chatted for a few and I thanked her for time and putting on the race. It’s funny, most of the time when I thank an official or director, they will generally thank me for coming out to race. With Bonnie it was no different. I have a feeling that everyone loves Bonnie and she is the glue that holds the organization together.